Dakota is in the September issue of Vanity Fair. Our gallery has been updated with a scan from the issue. Dakota is on the April cover of Sunday Times’ Style issue! The spread features a beautiful photoshoot by Kerry Hallihan, which we have added to our gallery along with the digital scans. Dakota is on the April cover of C Magazine – California Style! The issue features a beautiful photoshoot by Zoey Grossman, which we have added to our gallery. I can’t believe how many things we’re getting this month! 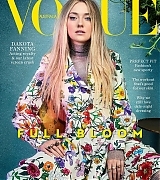 It has just been announced that Dakota is covering the February issue of Vogue Australia, which features a brand new photoshoot by Emma Summerton! The full cover story is already on the magazine’s website, and you can read it below. Our gallery has been updated with the cover and a couple of images from the featured photo session! The issue is on sale Monday, January 29. Perhaps it’s just clickbait, but it seems the more you look around, the more you become attuned to actors going method, being overtaken by their roles, getting lost in whatever emotional weight their character carries and their pains. We applaud the actors who go too far, I’m not saying they’re undeserving, but there’s something to be said for those who can take on the complexities of trying roles with a Teflon-like attitude. From age six, Dakota Fanning has been the latter. 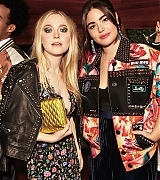 Whether she’s falling in love, being sexually abused on screen, committing a crime or dealing with death or mental illness, she’ll perform as if she’s lived it, but shrugs it away to the same tune: “It’s pretend.” It begs the question: is Dakota Fanning the most level-headed actress in Hollywood? It’s just leading up to Christmas when we speak. Having escaped New York for the holidays, she is holed up in her parents’ Los Angeles home. As happens to busy people this time of year, Fanning has come down with a flu that reared its head as soon as she stopped. A sickness, she says she’s been fighting off all year due to pressing schedules, international travel and work. Having spent a good chunk of her last year in Budapest filming her first television series, The Alienist (now screening on Netflix), Fanning is enjoying a moment of down time. This year will see her star in Australian director Ben Lewin’s film Please Stand By (Australian release to be confirmed), make a small appearance in the all-female Ocean’s Eight, and continue her work to get an adaption of Sylvia Plath’s The Bell Jar off the ground. 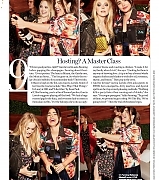 Dakota and her bff Alessandra Garcia Lorido are featured in the December 2017 issue of Glamour US! Our gallery has been updated with the scans and the photoshoot, which Dakota shared on her official Instagram account.